Production: Two Cities Film, presented by Eagle-Lion; Technicolor, 35mm; running time: 153 minutes, some versions are 137 minutes. Released 22 November 1944, Carlton Theatre, London. Filmed 9 June 1943–12 July 1944 in Enniskerry, Eire; and at Denham and Pinewood Studios, England. Cost: about £400,000. Producers: Laurence Olivier with Dallas Bower; screenplay: Laurence Olivier and Alan Dent, from the play by William Shakespeare; photography: Robert Krasker; editor: Reginald Beck; sound recordists: John Dennis and Desmond Drew; art directors: Paul Sheriff assisted by Carmen Dillon; scenic art: E. Lindgaard; music: William Walton; conductor: Muir Mathieson; played by: London Symphony Orchestra; special effects: Percy Day; costume designers: Roger Furse assisted by Margaret Furse; the film is dedicated to the Commandos and Airborne Troops of Great Britain—"the spirits of whose ancestors it has humbly attempted to recapture"
Cast: Leslie Banks ( Chorus ); Felix Aylmer ( Archbishop of Canterbury ); Robert Helpmann ( Bishop of Ely ); Vernon Greeves ( English Herald ); Gerald Case ( Earl of Westmorland ); Griffith Jones ( Earl of Salisbury ); Morland Graham ( Sir Thomas Erpingham ); Nicholas Hannen ( Duke of Exeter ); Michael Warre ( Duke of Gloucester ); Laurence Olivier ( King Henry V ); Ralph Truman ( Montjoy, the French Herald ); Ernest Thesiger ( Duke of Berri, French Ambassador ); Frederick Cooper ( Corporal Nym ); Roy Emerton ( Lieutenant Bardolph ); Robert Newton ( Pistol ); Freda Jackson ( Mistress Quickley, the Hostess ); George Cole ( Boy ); George Robey ( Sir John Falstaff ); Harcourt Williams ( King Charles VI of France ); Leo Genn ( Constable of France ); Francis Lister ( Duke of Orleans ); Max Adrian ( Dauphin ); Jonathan Field ( French Messenger ); Esmond Knight ( Fluellen ); Michael Shepley ( Gower ); John Laurie ( Jamy ); Nial MacGinnis ( Macmorris ); Frank Tickle ( Governor of Harfleur ); Renée Asherson ( Princess Katherine ); Ivy St. Helier ( Lady Alice ); Janet Burnell ( Queen Isabel of France ); Brian Nissen ( Court, camp-boy ); Arthur Hambling ( John Bates ); Jimmy Hanley ( Michael Williams ); Ernest Hare ( Priest ); Valentine Dyall ( Duke of Burgundy ); and Infantry and Cavalry by members of the Eire Home Guard. Awards: Special Oscar to Laurence Olivier for his Outstanding Achievement as Actor, Producer, and Director in bringing Henry V to the screen, 1946; New York Film Critics' Award, Best Actor, 1946; Venice Film Festival, Special Mention, 1946. Olivier, Laurence, and Alan Dent, Henry V , in Film Scripts One , edited by George P. Garrett, New York, 1971. Oakley, C. A., Where We Came In: 70 Years of the British Film Industry , London, 1964. Whitehead, Peter, and Robin Bean, Olivier-Shakespeare , London, 1966. Darlington, W. A., Laurence Olivier , London, 1968. Eckert, Charles W., editor, Focus on Shakespearian Films , Englewood Cliffs, New Jersey, 1972. Geduld, Harry M., editor, A Filmguide to Henry V , Bloomington, Indiana, 1973. Perry, George, The Great British Picture Show, from the 90s to the 70s , New York, 1974. Barsacq, Leon, Caligari's Cabinet and Other Grand Illusions: A History of Film Design , New York, 1976. Morley, Margaret, editor, Olivier: The Films and Faces of Laurence Olivier , Godalming, Surrey, 1978. Hirsch, Foster, Laurence Olivier , Boston, 1979; revised edition, 1984. Daniels, Robert, Laurence Olivier: Theatre and Cinema , London, 1980. Olivier, Laurence, Confessions of an Actor: An Autobiography , New York, 1982. Barker, Felix, Laurence Olivier: A Critical Study , Tunbridge Wells, Kent, 1984. Bragg, Melvin, Laurence Olivier , London, 1984. Silviria, Dale, Laurence Olivier and the Art of Filmmaking , Rutherford, New Jersey, 1985. Tanitch, Robert, Olivier: The Complete Career , London, 1985. Dunster, Mark, Olivier , Hollywood, 1993. Spoto, Donald, Laurence Olivier: A Biography , New York, 1993. Lewis, Roger, The Real Life of Laurence Olivier , New York, 1999. Granger, Derek, Laurence Olivier: The Life of an Actor: The Authorized Biography , New York, 1999. Variety (New York), 24 April 1946. New York Times , 16 June 1946. McVay, Douglas, "Hamlet to Clown," in Films and Filming (London), September 1962. Brown, Constance, in Film Quarterly (Berkeley), Summer 1967. Hart, Henry, "Laurence Olivier," in Films in Review (New York), December 1967. McCreadie, M., "Onstage and on Film," in Literature/Film Quarterly (Salisbury, Maryland), Fall 1977. Manheim, M., "Olivier's Henry V and the Elizabethan World Picture," in Literature/Film Quarterly (Salisbury, Maryland), July 1983. Reid's Film Index (Wyong), no. 4, 1990. Martini, E., in Cineforum (Bergamo, Italy), July-August, 1990. Nichols, Peter, "A Classy Tale," in Sight & Sound (London), vol. 1, no. 6, October 1991. Deats, S. M., "Rabbits and Ducks: Olivier, Branagh, and Henry V ," in Literature/Film Quarterly (Salisbury, Maryland), no. 4, 1992. Manheim, M., "The Function of Battle Imagery in Kurosawa's Histories and the Henry V Films," in Literature/Film Quarterly (Salisbury), vol. 22, no. 2, April 1994. Buhler, S.M., "Text, Eyes, and Videotape: Screening Shakespeare's Scripts," in Shakespeare Quarterly , vol. 46, no. 2, 1995. Crowdus, Gary, in Cineaste (New York), vol. 22, no. 1, April 1996. Bibliography, in Shakespeare Quarterly , vol. 47, no. 5, 1996. Griffin, C.W., "Henry V's Decision: Interrogataive [sic] Texts," in Literature/Film Quarterly (Salisbury), vol. 25, no. 2, April 1997. Royal, Derek, "Shakespeare's Kingly Mirror: Figuring the Chorus in Olivier's and Branagh's Henry V ," in Literature/Film Quarterly (Salisbury), vol. 25, no. 2, April 1997. Bibliography, in Shakespeare Quarterly , vol. 48, no. 5, 1997. At the beginning of his career Laurence Olivier did not specialize in interpreting Shakespearean roles on the screen. He had played many of Shakespeare's greatest characters on stage, and was especially praised for having alternated with John Gielgud in the roles of Romeo and Mercutio in the 1935 production of Romeo and Juliet at London's New Theatre. He was charming in the 1936 film production of As You Like It as Orlando, but he really didn't take his film career seriously until 1939, when he played Heathcliff in Goldwyn's production of Wuthering Heights . With the coming of war, his filmmaking was largely curtailed, but more than halfway through the conflict, when the Allied victory seemed certain, Olivier was released from his military duties to produce, direct, and star in a film to be made from Shakespeare's Henry V . Because the play is so patriotic, it was thought by the British government that the project would create a wonderful piece of nationalistic propaganda. Olivier had already played Henry V at the Old Vic, and knew what he wanted to achieve—a movie version that would restore glory to the common man's thinking about his own country. There were some preliminary setbacks. David O. Selznick refused to allow Vivien Leigh to play the role of the French Princess Katherine; he thought it too small a role for the star of Gone with the Wind . Olivier chose Renée Asherson, Robert Donat's wife, for the part. He wanted William Wyler as director, because Wyler had directed him in Wuthering Heights . But Wyler was busy on another project, and suggested that Olivier himself direct the film. Olivier considered it, and began preproduction work, but the film might never have been made, were it not for the efforts of an Italian lawyer, Filippo del Giudice, who had been the driving force behind Nöel Coward in In Which We Serve . 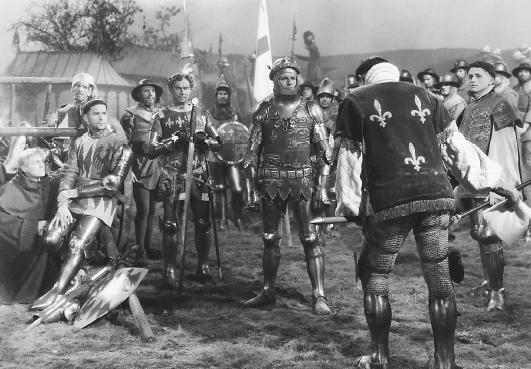 Del Giudice wanted another patriotic classic, and he eased Olivier's working budget of £300,000 upward more than another £100,000 for Henry V .
Olivier, preparing his own screenplay from the Shakespearean text, cut the play nearly a quarter so that he could give ample time to the staging of the Battle of Agincourt. He lifted the death of Falstaff from the last scenes of Henry IV, Part II , wisely casting a music hall comedian, George Robey, as Falstaff. He decided to begin his picture and end it as if it were a performance at the Globe Theatre in the time of Shakespeare, who had created the device himself when, in the lines of the Chorus in the Prologue, he instructs the audience, "On your imaginary forces work," leaving the way open for a very inventive cinematic trick: the camera pulls back, and we are out of the Globe and immediately into the conflict. The critic for Time wrote: "At last there has been brought to the screen, with such sweetness, vigor, insight and beauty that it seemed to have been written yesterday, a play by the greatest dramatic poet who ever lived." Henry V ran for five months in London, and it played on Broadway for 46 weeks. It opened the door for Olivier to other Shakespearean films. His Hamlet (1948) came next; then Richard III (1955). Ten years later in 1965 it was Othello , with Olivier as the Moor of Venice.